Michelle Hand, Jason Grubbe, and Steve Isom in Day of the Dog. Photo by Carol Rosegg. BOTTOM LINE: A sharply written and directed tragicomedy peeling off the layers of modern suburban families, with a blurred line between the natural and the bizarre. After several failed attempts by professionals to curb the violent behavior of the family dog Carrot, Paul (Steve Isom) has enlisted the assistance of a Canine Relations Specialist through the suggestion of a friend of a friend. Vadislav (Jason Grubbe), the ‘CRS’, has a unique approach to dealing with the situation -- a manner which seems quite ridiculous to Paul’s wife, Julianne (Michelle Hand). Is he a real doctor or an insane house invader? Is Carrot the problem or is the family? Can Paul and Julianne come to terms with their marriage before driving away their daughter? 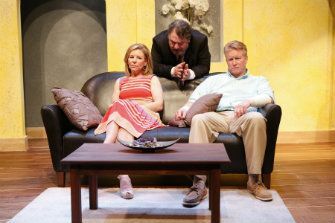 These are the questions posed in this comedy, which reveals a far deeper and more profound examination of the difficulties of marriage and keeping a home in modern America. It’s a bit difficult to delve into this piece without giving away any spoilers, but suffice to say there are myriad twists and turns that keep the action moving despite only having three characters per scene. This is definitely helped along by the production and performances, most notably Hand who delivers a subtle and nuanced performance that bristles under the surface of her always in control persona. Grubbe, as Vadislav, is also both entertaining and weird; constantly eliciting laughs from the audience while instilling the same doubt in his credential and motives that Julianne feels. Milton Zoth's direction is likewise spot on and brisk. It is also worth mentioning the set design, as Julianne is a very precise interior designer. In a small off Broadway theatre, Cristie Johnston has designed and decorated a set that is incredibly nuanced. Every aspect of the family’s living room is rendered with a purpose and utilized and referenced by the play down to the exact positioning of rocks in the centerpiece of the coffee table. All of this pristine Feng Shui constantly threatened by Vadislav’s investigation as well as Carrot’s intimidating barking from the yard is a powerful representation of the glass houses that exist throughout the American suburbs. But the real star of the evening is Daniel Damiano’s text. His voice is distinct and refreshing with a tone that reminds me of an Edward Albee with a bit more rooting in reality. Sure the mounting aspects of the darkness under the surface of Paul and Julianne eventually gets a bit unbelievable, but the denouement still grounds the evening with a force that brought unexpected tears to my eyes. His is definitely a name that I look forward to seeing future work from.